Recent environmental watering has provided important habitat for native fish, plant, waterbug and other species during dry times by filling up key drought refuge pools. "A resilience survey we undertook in 2016 highlighted the ability of the Wimmera River to withstand the stresses of drought due to environmental watering from 2010–14," explains the Wimmera Catchment Management Authority's (CMA) Greg Fletcher. "Carp numbers are down compared with previous years. 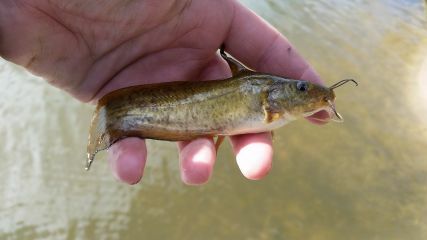 Surveyors found small native fish like common galaxias and good numbers of flathead gudgeons." Despite dry conditions, freshwater catfish (below) continued to be found in the Wimmera River due to the drought refuges provided by environmental watering. Another significant find in 2016 was a western swamp crayfish, a critically endangered species found for the first time near Mokepilly in Mount William Creek, a refuge pool that received environmental water in 2015 and 2016. CMA monitoring shows platypus also continue to do well on the adjoining MacKenzie River, despite the dry conditions. Two platypus, one adult female and one juvenile male, were captured during surveys in March 2016. The juvenile is the fifth juvenile recorded in the last three years after no juveniles were found between 2006–13. The female was first captured as a juvenile the previous year, confirming young platypus are surviving and successfully maturing. Jeparit Angling Club president Rick Day said, "The river makes the town. The river is the town." 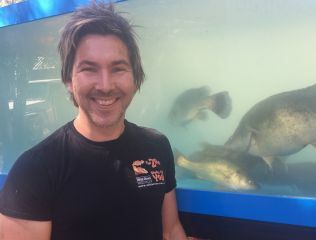 A giant golden perch, fondly named Spotted Bess, made an appearance at a local fishing competition on the Wimmera River in 2016, highlighting the benefits of environmental watering for native fish. Named for the large black spot on her side, Spotted Bess was caught and released at the 2016 Horsham Fishing Competition, which attracted over 2,000 people and raised more than $12,000 for community projects. Horsham local Adam Shields won the first prize, a new car, for catching her on the Sunday of the Labour Day weekend. The next competition is on the Labour Day weekend in 2017, visit horshamfishingcomp.com.au. The large female fish was first discovered during electrofishing surveys in 2012 and 2014 and continues to thrive in the Wimmera River thanks to environmental watering.